Statue of John Henry, Talcott, Summers County, West Virginia. This is one of two sites (the other is in Alabama) that lays claim to providing the historical foundation for the story of the competition between John Henry and the steam-driven machine. Via Wikipedia. Actually, this isn’t so much a Teaching idea as it is a nudge to me to do some archival stuff in the future in support of a Teaching Idea. 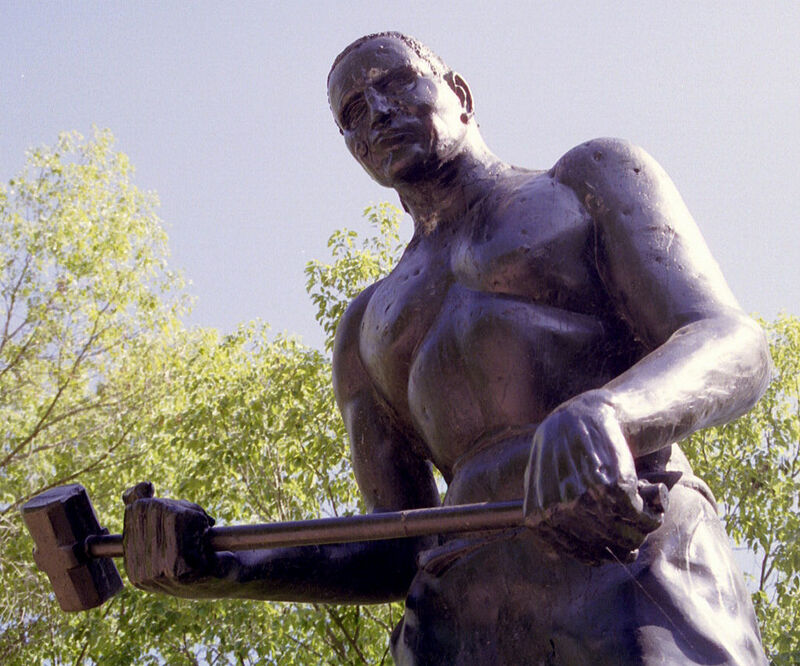 For a few years now, I’ve had the idea of using the multitudinous pre-WWII versions of “John Henry” as a way of getting adventurous students to think about and speculate on the subjects of American legendary figures, the mechanization of labor, differences and similarities between white and black attitudes about labor, and–heck, why not?–even thinking about music itself in an age before music-making and -marketing had become a national industry. Well, you can probably guess, just from that little description, that none of my students has yet taken this up as a research project. Some of that’s on me and how the prompt is written: it’s just too busy. But some of it is surely due to the scattered nature of the materials themselves, not to mention the rather ephemeral nature of the Web itself: as a source for my students, I had been relying on one blog’s round-up of around 100 versions of “John Henry” or songs that in some way addressed that tradition . . . and then that blog just went away. So. It won’t be this summer because of book-project stuff, but this fall or next spring that’s what I’ll be doing. It’ll have some links to historical stuff, but its main focus will be on the songs themselves, along with background information, wherever available, about the performers. I’m persuaded that the number and variety of this/these song(s) can tell the thoughtful listener a great deal about us as a nation, or us as we existed around a century ago; maybe, with the existence of one centralized place for recordings and some information, I can encourage my students (and whoever else might happen upon it) to think about those things, as well. EDIT: Before I forget it, there was, accompanying the Powers article above, this round-up of good online archives of music, some of which will come in handy once I get started on this thing.